Today let's go over different types of relaxation audio. Relaxation audio is a collection of calming sounds that helps you sleep or unwind. I have discovered four types of sounds that are popular for their calming properties and can easily knock you out. Firstly I would like to introduce ASMR. Though ASMR (Autonomous Sensory Meridian Response) is a type of auditory stimulation, which put simply, is relaxation audio. ASMR is great for relaxing and is amazing for helping people fall asleep. It has become increasingly popular over the days because of its characteristically soft and sleep-inducing sounds. Most ASMR audio can be found on the site Youtube, and is great for dozing off to. Below is a link to an example of this audio. It’s one of my favorites and is very interesting. Do not forget to put on headphones because that is what makes the experience so phenomenal. Sometimes the Youtubers that create these videos reenact relaxing situations like a scalp massage, haircut and more. Now I'll remind you of a classic all-time favorite: classical music. Classical music is great for ambience, which means that you can listen to it anytime. It’s great for sleeping because it can be played at a very low volume and barely be noticed. It’ll block out almost any noise that may be preventing you from sleeping. The soothing noise of the different orchestral instruments is also very helpful in relieving your stress. I find that even just the sound of solo instruments (i.e. just a piano or violin) is good for helping you relax. If you hate orchestral music, just any type of relaxing music you like played at a low volume should help you sleep. Another type of relaxation audio is white noise, which is a simple, repetitive noise that is known for its sedative properties. White noise is specifically engineered to block out distracting sounds and geared towards helping you focus on a particular task. This means you can be devoted entirely to relaxing and feeling better. There is also recent research that the noise tunes out your organs’ natural internal systems by signaling the brain to do so. This is probably the best option you have for falling asleep and staying asleep but probably the least exciting. This machine is a white noise generator and has many different options all for therapeutic purposes. The final type of audio I would like to mention is sounds of nature. Whether it be the gust of wind or the relaxing sea, I would strongly recommend this audio because of the primal nature of it. If you think about it, our primal ancestors had to sleep outside in nature and would have probably been hearing the sounds of the forest as they were falling asleep. Therefore our brains might be wired evolutionarily to sleep to these types of sounds. This is purely theoretical, so I don’t know of any studies that support this idea. The white noise generator I mentioned also has nature sound effects as one of its many different options. Happy listening, and good luck relaxin’! 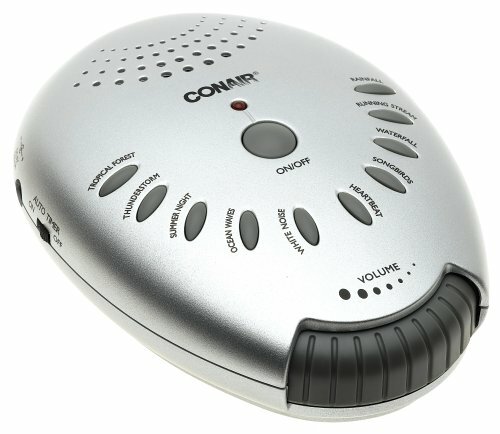 Has a white-noise generator but also elements like ocean waves tropical forest.